Wounded Times: PTSD for Firefighters is real. So are their suicides. PTSD for Firefighters is real. So are their suicides. The Firefighter Behavioral Health Alliance estimates about 30 percent of the nation's 1.3 million career and volunteer firefighters suffer from PTSD, with 132 suicides by active and former U.S. firefighters and paramedics reported last year. Officials believe those numbers are low because of misclassifications. Studies show firefighters are three to four times more likely to kill themselves than die in on-duty accidents. 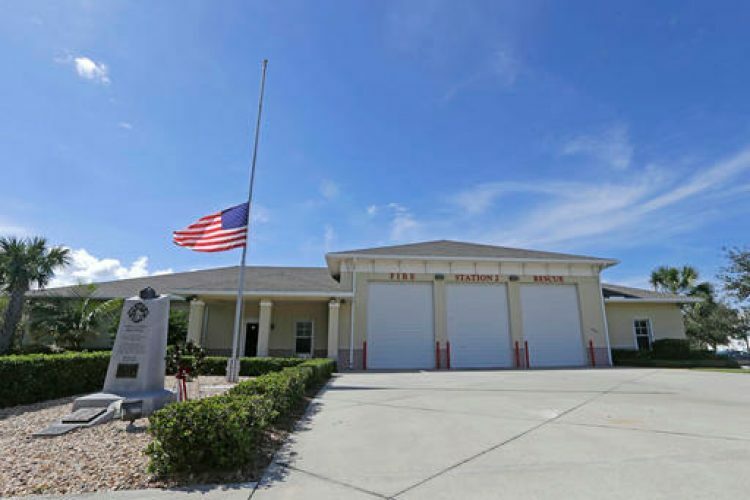 In this photo taken Monday, Oct. 24, 2016, the American flag is flown at half staff in front of Fire Station 2, honoring Vero Beach Battalion Chief David Dangerfield, in Vero Beach, Fla. The suicide of a firefighter who had a reputation for being a brave and positive force in his Florida community has shined a light on post-traumatic stress disorder in his profession. There have been recent national efforts to train firefighters to recognize PTSD and to remove the stigma of seeking help. VERO BEACH, Fla. (AP) — Battalion Chief David Dangerfield's nickname was "Super Dave," a moniker the veteran firefighter had earned over the years for his cheerful, get-things-done personality. The leader of a fire department dive team in a quiet Florida beach community of 15,000 volunteered for charities helping kids and families and was the 2013 Treasure Coast Emergency Service Provider of the Year. But one Saturday night last month, Dangerfield posted a Facebook message that revealed a world of pain behind the brave facade. "PTSD for Firefighters is real. If your love (sic) one is experiencing signs get them help quickly. 27 years of deaths and babies dying in your hands is a memory that you will never get rid off (sic). ... My love to my crews. Be safe, take care. I love you all." He then drove to some woods, called 911 and told the dispatcher where his body could be found. He hung up and fatally shot himself. He was 48.